Last month, federal antitrust regulators officially cleared the $65 billion merger between Charter Communications (NASDAQ: CHTR) and Time Warner Cable, two of the country’s leading cable and Internet service providers (ISPs). The deal will bring some minor changes for residential Internet users in the Milwaukee area, where Time Warner had amassed significant market share. For many of them, monthly billing statements will now be printed on Charter letterhead instead of Time Warner. And “Call Charter” is how the to-do list item will read if someone is moving in or out and wishes to activate or deactivate service. Still, the merger is likely to have little immediate impact on the market for Internet access in Milwaukee, says Keefe John. He’s the founder and CEO of Ethoplex, an ISP based northwest of the city, in Germantown, WI. But their grip might loosen somewhat before long. Ethoplex, which has focused on business users for years—its client roster includes more than 500 companies with employees in Wisconsin, in sectors ranging from education to hospitality—now also offers high-speed Internet service to Milwaukee-area residents, via innovative “fixed wireless” technology. “We have this really big network built, and we thought that we just might as well leverage it to deliver competitive residential Internet as well,” John says. Wired Internet typically permeates buildings from the bottom up; an underground copper or fiber cable carries in a signal, and users can access the Web through an Ethernet cord or a Wi-Fi router. Ethoplex and other ISPs are inverting that approach by bringing in Internet service from the top down, through a network of antennas attached to buildings and towers. 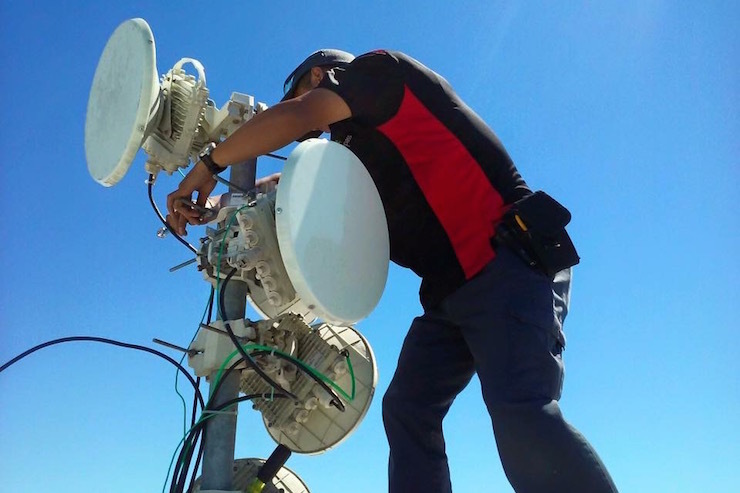 Mimosa, a Santa Clara, CA-based manufacturer of fixed wireless equipment, provides the hardware that Ethoplex uses to beam connectivity from 30-plus origin—or “repeater”—sites in the Milwaukee area to the places where its customers work and live, John says. Other wireless ISPs, like San Francisco-based Webpass, have sometimes had difficulty getting the green light from landlords to mount network nodes on their buildings. Ethoplex charges residential customers $50 a month for 100 megabits per second, which is about 10 times the speed of a basic cable modem. Users with large appetites for data—those whose work involves downloading high-resolution medical images, for instance—can pay more for even faster speeds, John says. Residents in multifamily buildings can get gigabit service (1,000 Mbps) for $90 a month; for users in single-family homes, the fastest option is 500 Mbps, which John says also costs $90 monthly. There are no caps on data use, he says. Ethoplex’s residential service is “available right now in a few areas” of metro Milwaukee, John says. Determining eligibility, however, is not as simple as calling a cable company and asking whether a particular address is in that provider’s service area. That’s because the service is delivered via point-to-point, line-of-sight transmission between antennas.